Last week I was the unfortunate victim of one of the most humiliating of stunts that women foist upon men. It's the female equivalent of that old school yard trick that boys will play upon each other-- when someone points at a pretend spot on your shirt, you look down, and they run their finger up your face. We older men are wise to this particular trick and rarely fall for it, just like we're wise to the women's trick when attempted by our spouses. I was nailed by the trick this time, however, as it was perpetrated by a colleague. It was executed with near perfection, and quite frankly I just let down my guard. The punking goes something like this: 1) Woman works her way into close proximity to the target; 2) At just the right moment she feints being distracted by something demanding her full attention (like a child running into the street); 3) In a moment of panic she thrusts what is in her hands into the arms of the unsuspecting victim; 4) The target is suddenly left holding the bag; and 5) She pretends to be distracted, or even better exits the scene of the crime so as many people as possible can observe you holding her purse. Which brings me to my fashion tip in regard to the murse (man bag, man purse, mClutch). This is very similar to my advice in Fashion Tip #1. Carrying a murse is all about making a statement. You're saying, "I'm man enough to carry a murse, and I don't give a crap what any of you think!" If you're going to carry a murse you need to go all-the-way. Here are a couple of examples of the right and wrong way. In the first example you see Jack Bauer carrying a murse that could just as easily be a computer bag. No one is fooled by this compromise. Everyone takes one look at his man bag and thinks, "I thought Jack was the proverbial man's man? What's with the murse?" They say this because carrying a murse like his just shouts-out, no guts! If you're going to carry a murse it absolutely must not be large enough to carry a laptop, and preferably it shouldn't even be large enough to carry Jack's Glock. 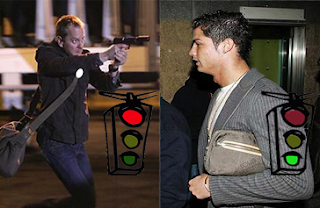 In the second example we find European soccer star Cristiano Ronaldo sporting a mClutch. Does his mClutch look like it could have a computer inside? A gun with extra clips? Does it match the rest of his attire? Does it have any other purpose in life? Most importantly, does he look like he cares for one minute what you think? Exactly! It's perfect. There's a lesson in this for all men. Which brings me to my Fashion Tip #2: If you're going to sport a murse you should at least have the testicles to carry it like a woman.